A lot of time in July was spent putting in some new monsters that completed all their art and animations, adding new behaviors for some monsters that already had art, and adding some game engine features to support the new behaviors and skills. First off is the Fire Giant, we’ve had his artwork and animation in for a while now, but he didn’t do anything but a basic melee swing with his axe. 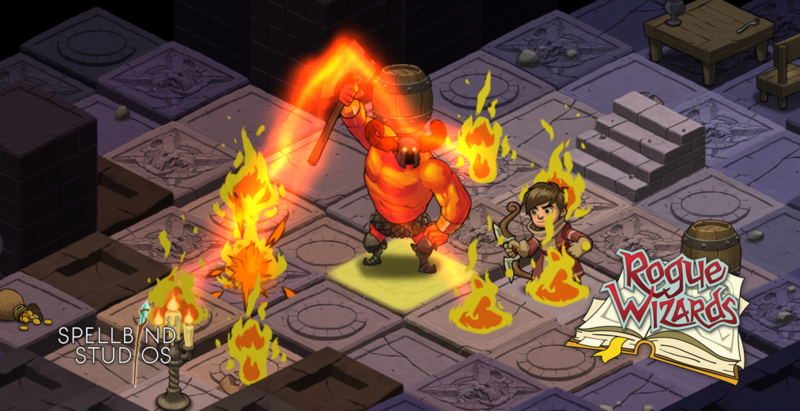 Now the Fire Giant has a magic spell that shoots rays from his axe to several locations around him. At every location a burning fire hotspot is created which remains for a few turns. Additionally, any items at the location of a fire ray hit will be permanently destroyed and can’t be picked up. Alex and Aden finished the artwork and animation for the Disturbling, a super crazy cosmic creature. 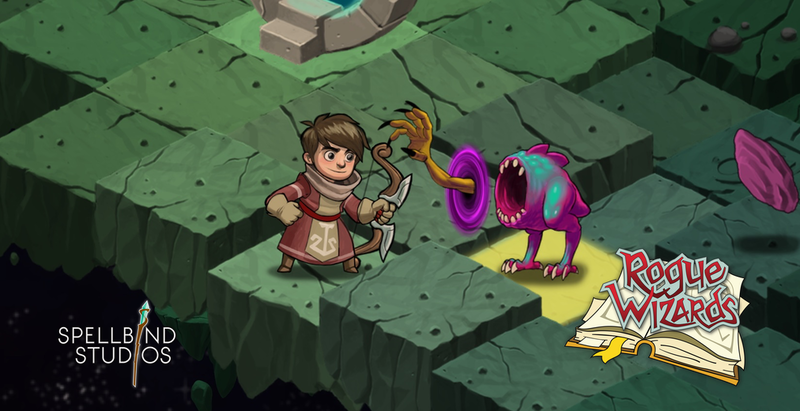 He’s got a bite melee attack, but has this really twisted looking magic attack where a hand comes out of a portal that opens in front of his mouth. Not sure what that’s gonna do yet. 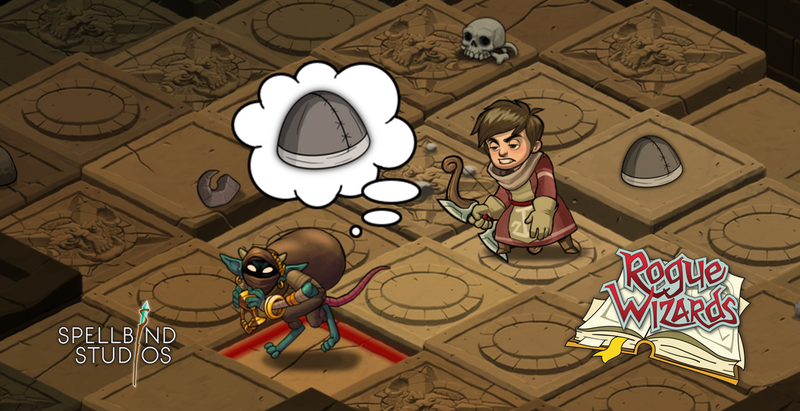 The Thiefling is a new creature that can steal items from the player. He’ll prefer to steal items that are currently equipped or on the shortcut bar of your player, but sometimes also dips deep into your backpack and can steal any item. Watch out if he steals a stack of magic materials, you might quickly find you can no longer cast that fireball spell you had readied. – New Creature: Thiefling … these rat like hunchbacks can whip you with their tail or steal an item from your inventory and quickly flee with it. – Fire Giant now has a ranged magic attack in which he raises his weapon and fires 3-6 bolts at surrounding cells causing a fire hazard to appear at the target and permanently destroying any items on the ground there. – When you destroy an item for the first time, you now get a confirmation dialog to make it clear that the item is being destroyed and not un-equipped or dropped or something. – Refactored rope chain skills so that base classes of DoSkill() are always called where important things like storing the turn action id happen etc. – RopeSkill and RopeSkillPrototype are now abstract classes from which to build more complex skills like RopeChainSkill, FireRaySkill etc. – Loot tables can now specific “All” instead of a random number of picks … in this evaluation order, every entry is evaluated once in the order that they appear in the table. – The InputManager is now capable of pushing and popping listener/controller pairs without having to have the code itself be bookend structured with push1->push2->pop2->pop1 … we can now support push1->push2->pop1->pop2 to allow for a more natural flow to writing the code in some situations. – Fixed pooled actors immediatly destroying themselves upon re-use if the last animation they played was a “die” animation, which is actually pretty common. Actors are no longer destroyed when a “Die” aniamtion is ended, only when it is completed. A pooled actor that last played die, and then plays idle, “ends” the die animation … which shouldn’t be a trigger to fade out and destroy. – Fixed the stolen loot dropped by a Thiefling having a scale of zero (and therefore being invisible) if you killed the Thiefling via the Banish spell, the banish logic now restores the actor scale to 1.0 before killing/destroying them which also restores scale on any contained child game objects / items. – Fixed spine objects having one frame of wrong animation upon instantiation if later in that same frame they were directed to play a different animation … there is an old field _animationName that is serializable and casuing the issue, so I’ve nulled it for the player and Esoteric is going to refactor their code sometime in the future. – Fixed human female item right animation pop after playing attack_02, for some reason there were two “Item Right” bones in the dopesheet … will send the messed up file to Esoteric Software for fixing.